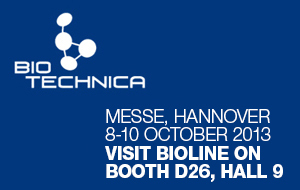 Bioline: The PCR Company, a global leader in molecular biology innovation, will be exhibiting (Hall, 9, Stand D26) and presenting (Hall 9, Stand F69) at Europe's leading life science, biotechnology and laboratory show, BioTechnica 2013 (8-10 October, Hannover, Germany). Our Senior Global Product Manager, Dr. Steve Hawkins, will discuss the evolution of direct PCR amplification technologies as part of the prestigious Biotechnica Innovation Forum. The recent increased focus on innovation in biotechnology and medical diagnostics within the world of life sciences has led to important advances in molecular detection and biomedicine. Bioline is proud to be at the forefront of some of the key developments in PCR technologies that are actively accelerating the pace and success of research for scientists around the world. Molecular screening of blood samples for blood-borne pathogens, blood cell irregularities and blood group genotyping is a routinely performed process, but can be fraught with stumbling blocks. Some of the key concerns when using PCR to analyse DNA isolated from blood cells include the potential for false-negatives, or poor results that arise from a lack of sensitivity induced by the presence of PCR inhibitors in blood. Common reaction inhibitors include hemoglobin, IgG, lactoferrin, proteases, anticoagulants and salts. Our presentation at the Biotechnica 2013 Innovation Forum is titled 'Fast PCR, Direct From Whole Blood, Without Compromise'. The talk will provide an overview of how technical challenges from direct PCR amplification of blood samples can be overcome using the very latest in direct PCR developments. We will outline an extremely rapid workflow that is specially engineered to overcome various PCR inhibitors typically present in whole blood samples that remove the need for pre-treatment or DNA isolation. Ultra-fast PCR protocols specially developed to deliver significantly increased sensitivity and PCR success rates, without compromising quality and yield, will also be covered. We will also show how the speed and specificity of these techniques discussed make them the perfect solutions for performing high-throughput end-point multiplex PCR direct from whole blood. Further details of our upcoming presentation at the Innovation Forum can be found on the Biotechnica 2013 web site. Throughout the three days of Biotechnica 2013, we'll be presenting all the latest innovations across our endpoint-PCR and real-time PCR product lines. If you're attending, you'll find the brand new Bioline stand in Hall 9, Stand D26 where you will also be able to enter our iPad prize draw. We invite you to experience the power of the latest in life science innovation with Bioline and look forward to seeing you there.